A place I always have wanted to try in London is Coppa Club. 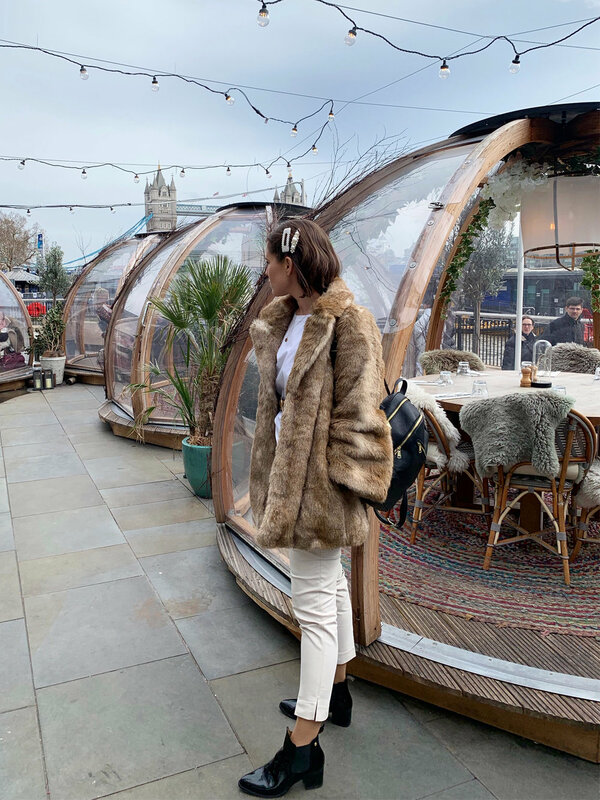 They have transformed their terrace into the cosiest set up, with small igloos filled with fluffy blankets and lights. The dream location for a lovely breakfast, lunch or dinner. We walked by it on our last day in London, after having visited Sky Garden, and it was as pretty as it looked on the pictures. I ordered a super greens & grains consisting of quinoa, farro, fregola, squash, salad leaves, broccoli, house dressing, chilli & toasted seeds, topped with halloumi. So yummylicious! We sadly didn’t have a booking so we had to eat inside the restaurant which in my option isn’t that cozy, so if you want to go there, make sure to book beforehand. The whole area isn’t really a favorite of mine, but if ever nearby I would recommend it. Read more and book a table here.